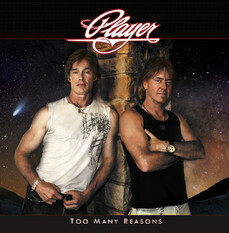 RockUnitedReviews: PLAYER: "Too Many Reasons"
To make a long story short - Player - basically HALL & OATES - minus the R&B. PLAYER - the even whiter version of white man's version of soul music. Picture the smokey bar, soft and fluffy pillows, the occasional guitar - Big city neon lights and laid-back westcoast summer nights. The very definition of Yatch Music? Does it scream of David Foster. Say hello to my little friend - Mr. Smooth! I can't say that I ever watched any episode of 'The Bold And The Beautiful' since it's some kind of awful daytime soap opera. Appearantly the main PLAYER of the band (Ronn Moss - vocals/bass) better known as Ridge Forrester to daytime viewers. That's clearly not the main point and issue though. A couple of tracks on display. "I Will", proper soft-rock in the vein of latter days Hall & Oates. The refrain to, "The Sins Of Yesterday", will remind you of ALL-4-1 and their 1994 mega-hit, "I'll Swear", which has one of the best soft-rock lines ever (I swear by the moon and the stars in the sky - I'll be there) and obviously the work of Mr. westcoast producer himself aka David Foster. Let's face it, the verse simply reeks of Hall & Oates and why not give 1980's U.K. musician Paul Young a call too. Final verdict: ultra soft-rock and proper craftsmanship from opener "Man On Fire" to the closer of the remake of their late seventies hit "Baby Come Back". Too Many Reasons - never dull, never truly satisfying.